The Russian's began to move in to Central Asia during the early 1813, and the Bolsheviks pushed on after the Russian Revolution, securing control of the central Asian territories. The Uzbek Soviet Socialist Republic was declared in 1924. Its first flag was a red banner, with the letters U.S.S.R (Uzbek, not Union!) in Cyrillc, and in Arabic, in gold, in the upper hoist canton. In 1926, the Arabic was removed, and the lettering was now transcribed in Uzbek, Cyrillic, and in Tadjik. Then, in 1931, the Tadjik ASSR was split from the Uzbek SSR, and the lettering in Tadjik was removed from the flag. The flag of 1937 saw the lettering replaced with actual text. Ozbekistan SSR in Latin, and in Cyrillic. 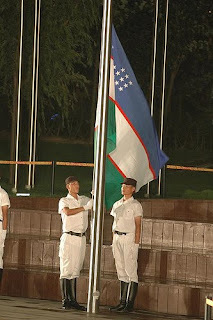 However, it was quickly replaced with a flag that switched out the Latin, and replaced it with Uzbek. Then, in 1952, Uzbekistan followed all the other SSR's by altering the flag. They took the standard Soviet banner, and placed a central blue stripe running horizontally through the flag. The blue stripe was edged with 2 thin stripes of white. This flag remained in use until independence. The Uzbek flag was adopted in 1991, and is a tricolour of blue, white, and green. With the blue and green stripes being separated from the central white by a thin stripe of red. On the hoist side of the top blue stripe is a crescent and cluster of stars, with 12 stars arranged in a box formation. The blue represents water, so vital to a land-locked nation, the white represents purity, and the green represents the renewal of nature.The thin red stripes represents the flow of energy through the land. The crescent represents the nations hope for the future, and a link with the nations historical traditions. The stars are from the nations ancient sun calendar.